Are you looking to setup your own business in the UAE? Enjoy 100% company ownership with Fujairah Creative City Free Zone. 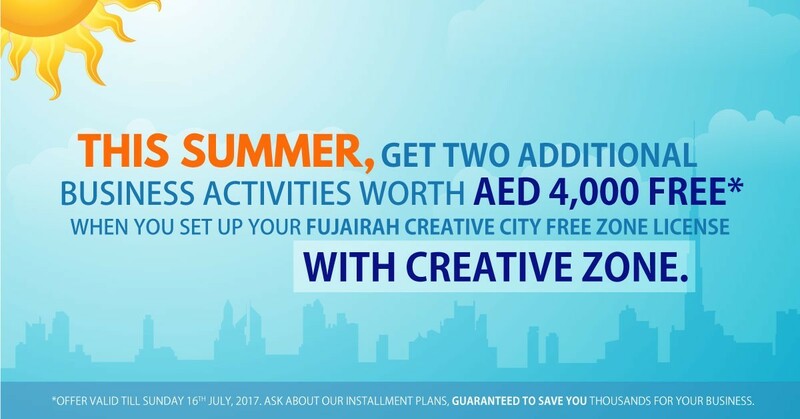 This summer, CREATIVE ZONE is giving you two additional business activities completely free. Saving you AED 4,000 worth of savings! We provide tailored installment packages and license renewal plans to help SMEs save money. Your physical presence is not required to setup your own business in the free zone. The company setup process can be completed from the comfort of your own home via our simple and quick application process. Furthermore, if you already hold a UAE residency visa, we don’t require an NOC from your current sponsor in order to form your new company. Your company will not also be required to have large share capital amount in your bank account or even go through annual audits for license renewal. You are also entitled to have 6 UAE residence visas for your staff. Plus, all company documentation are issued within days! CREATIVE ZONE provides professional and transparent business setup advise and will make recommendations based on your unique requirements. Our dedicated account managers team provide on going support and advise beyond the company formation process for the lifetime of your business. Take the first step on your entrepreneurial journey by talking to one of our business setup advisors today. Call us at 04 567 7333 or live chat with us.